After many years as an atheist, I recently found myself at mass. Afterwards, I was struck by how automatically the responses and prayers came back to me and my similarly lapsed family after years of neglect, buried somewhere in a part of my brain that could be dedicated to more practical things. We have so many of these automatic responses in our head. If you ask any Irish person of my generation, they will be able to reel off, word for word, the instructions given to us in our end of school aural Irish exams. And if you tell someone that you don’t eat breakfast, they will automatically tell you that it is the most important meal of the day. I know this, because I have heard that phrase more times than I can count. I have never warmed to breakfast. I don’t like eggs or milk or any of those healthy sensible things that people start their day with. No matter how many berries, spoonfuls of honey and sprinkles of cinnamon you put on porridge, it is still just dressed up cardboard paste to me. 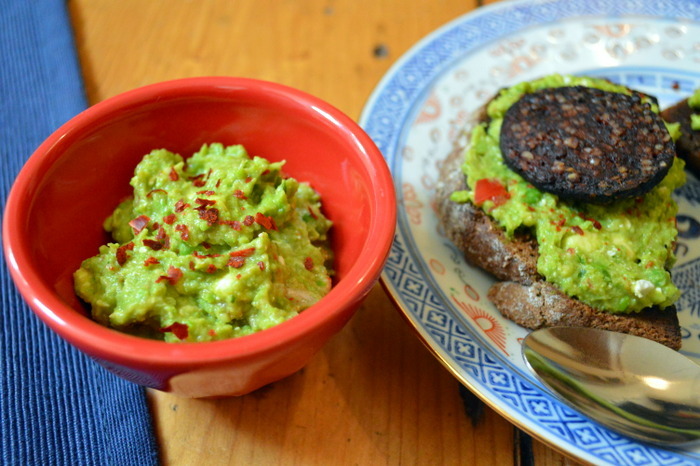 What I do like are breakfasts that are indistinguishable from lunch or dinner. After the amazing fatteh I had in Berlin, I started thinking about how I could adapt a meal like that into a healthy, portable work breakfast, and came up with the idea of oven roasted chickpeas.These chickpeas gave the crunch I liked in the fried bread from fatter but not the fatty heaviness. Topped with some greek yoghurt mixed with tahini, a squeeze of lemon juice, and some torn up mint leaves, they make a simple breakfast. The trick is to get the plumpest chickpeas you can find, the ones that have been slightly overcooked so they are starting to split. Chickpeas from a jar are good for this, also the cheaper supermarket brands like Lidl. The plumper the chickpeas, the crispier the outside coating becomes, I can’t explain why. I like to make a big batch, which can be stored in an airtight container in a fridge for 5 days or so. This makes four breakfast servings, or you could mix them with chopped tomatoes, cucumber, fresh mint, dill and yoghurt dressing to make Morito’s famous crispy chickpea salad. Toss the chickpeas in oil, then the spices, salt and ground pepper. Roast in the oven at 200C for 30-40 minutes until crisped and browned. Keep for up to five days in an airtight container in the fridge. New potatoes seem to be a bit of a Danish obsession. When they first appear in May, they can sell for up to 1000kr (about €135 or $178) a kilo at auction, which seems a bit excessive to me. Now that it is July, we are swamped with them, and they are dirt cheap (pun intended). Ours usually come from Samsø , an island near Aarhus which is famous for being a model community of renewable energy, with 100% of its electricity coming from wind power. A number of Danish cities are moving towards becoming carbon neutral, and the community on Samsø is the model for this. 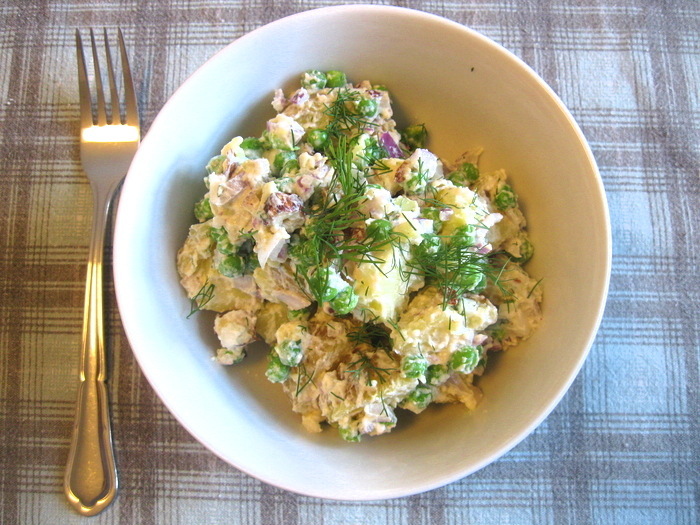 I am perhaps not as fascinated by new potatoes as the Danes, I love a good potato salad, and I think this is the best I’ve made. 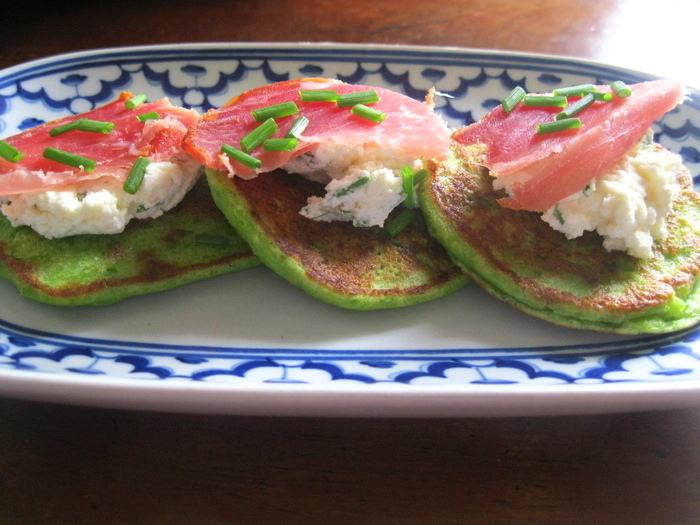 I’m still struggling through the 5:2 diet, and make a modified, blander version of this on fasting days. For those not obsessively watching their calorie count with the kind of obsessive fear usually reserved for discovering you are in close proximity to a cranky looking bear, this is a great summer dish, full of fresh and sharp contrasting flavours. Boil the potatoes in salted water for approximately 20-25 minutes until soft. If they are big, or of lots of different sizes, cut them into roughly even pieces to ensure they cook at the same time, but watch them carefully as this raises the chances of them being overcooked and mushy. Remove them from the water when cooked and drain. Add the peas to the water if using frozen ones and cook as per package instructions (usually 1-2 minutes). When cooled but still a little warm, chop the potatoes into bite size chunks. Mix the creme fraiche, mustard and honey together to make a dressing. Put the potatoes and peas in a large bowl. Toss with the dressing and add the remaining ingredients. Squeeze the lemon juice over, check seasoning and serve. 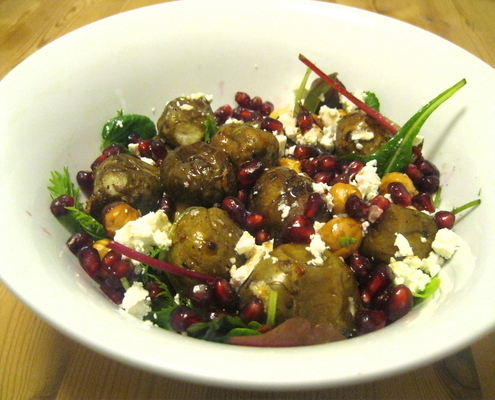 This is a rich and complex winter salad, perfect for accompanying grilled meat. Jerusalem artichokes are neither artichokes, nor from Jerusalem, so they probably win the prize for the world’s most confusing vegetable name. In America, they are called sunchokes, but to be honest that sounds more like the name of Bond villain to me. Sunchoke could try to match Blofeld’s plans to destroy British crops by destroying the sun, and possibly be funded by some kind of shady neo-con climate change denial organisation. He would wear a lot of fake tan. Clearly, I have very little to say about this salad, except that it really is lovely, and should the Ian Fleming Estate wish to contact me to commission a novel, my contact details are on the about page. I am sure I can give Sebastian Faulks a run for his money. Serves 4 as a side dish. Wash and trim the artichokes of all the weird nobbly bits. Toss in 1 tbsp olive oil and roast at 190C for approx 30 minutes until tender inside. Roast the hazelnuts in the oven on a baking sheet for 5 minutes (watch closely at the end, they go from nicely roasted to horribly burnt very very quickly). Make the dressing by combining the final four ingredients. Roughly chop the hazelnuts once cooled. Put the washed salad leaves in the bottom of a large bowl. Toss about 3/4’s of the dressing. Add the artichokes, pomegranate seeds, crumbled feta and hazelnuts on top. Pour over the remaining dressing. This is a recipe from Darina Allen’s ‘Forgotten Skills of Cooking’ which she advises to make when you have a ‘glut of onions’. 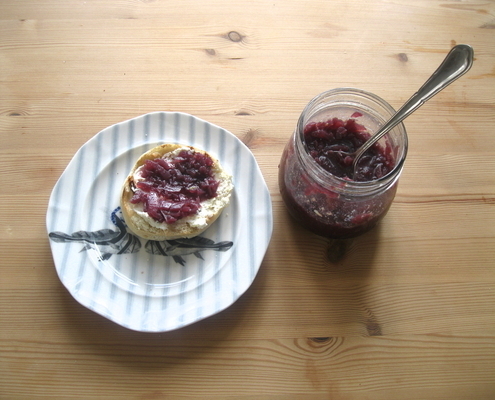 I’m not really sure when you would find yourself with a glut of onions, I certainly never have, but did have a glut of leftover cooking red wine (an equally rare occurence) and decided to use it on this.Onion jam is rich and savoury-sweet, great with pates or in sandwiches. Peel, slice and roughly chop the onions into 2cm (ish) pieces. Melt the butter in a large saucepan over a low heat and slowly cook until it turns brown (be careful, it takes a while for it to go brown, but once it does it can very quickly burn). Add the onions and sugar, mix well and season with salt and pepper. Cook, covered with a lid, over a low heat for half an hour, stirring occasionally. Add the wine and sherry and cook for another 3o minutes without a lid, stirring frequently. It won’t reduce too much, and should still be a bit liquid when put in the jars. Sterilise the jars in an oven at 180C for 10 minutes, and fill while they are still hot. Over the past month, I have been in a self-imposed study/job hunting hibernation. It turns out that finding a full-time job in a country where you do not speak the language, and do not live during a recession is not a walk in the park. The same goes for professional law exams. Shocking, I know. My world has largely shrunk to the four walls of my room, and I now consider the cast of the West Wing, the lecturers in the online courses I am taking, and my cat to be valued members of my social circle. This is all by way of explaining that grocery shopping and cooking have fallen far down the list of priorities, and my meals tend to consist of working around whatever is lying my parents house (who are kindly hosting my self-imposed exile) and needs using up. 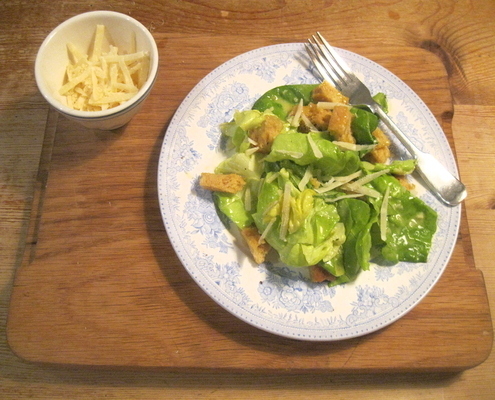 Yesterday, it was lettuce and so it was Caesar salad for dinner. Traditionally Caesar salad should be made with crispy Romaine or Cos lettuce, but I am not a big fan of spiney lettuce, and so bog standard just labelled ‘lettuce’ was fine with me. This is a classic dish which has been horribly abused the world over, but it is very quick and easy to make your own. The recipe is slightly adapted from Alastair Little’s ‘Keep it Simple’ and that is what I did. I (yes, I know this is Caesar salad sacrilege) do not really like anchovies, so tend not to serve them on top, but might add a small amount of minced anchovy (1/2 teaspoon or so) to the dressing. To make the croutons, tear the bred into small 2-3cm cubes. If you have the time, toss with 2 teaspoons of oil, place in a baking dish and bake at 160C for about 45 minutes or until crisp and golden on the outside. If you are in a rush, you can fry them in oil. Place the egg yolks in a bowl along with mashed anchovy,worcestershire sauce, garlic, water and lemon juice and whisk together. Gradually add the oil bit by bit, whisking the whole time until it emulsifies. Stir in half the grated parmesan. Rip up lettuce into large pieces. 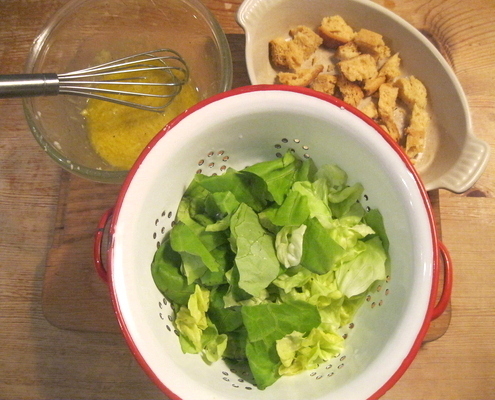 Toss lettuce with the dressing and the croutons. Top with anchovies if desired. Serve the remaining parmesan in a bowl, so people can add as much or as little as they want (if give my way I would add an unwholesome quantity that I will not recommend here).